The monoclonal antibody KUL01 is useful in the study of the development, distribution, function, and ontogeny of the mononuclear phagocyte system (MPS) of the chicken by exclusively recognizing the cells of the MPS. It identifies chicken monocytes and macrophages as well as interdigitating cells and activated microglia cells. 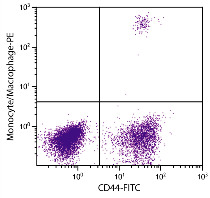 This antibody does not react with B (Bu-1+) or T (CD3+) lymphocytes.